Planning board chairman Janet Weidner explains bylaw, more than a year in the making. 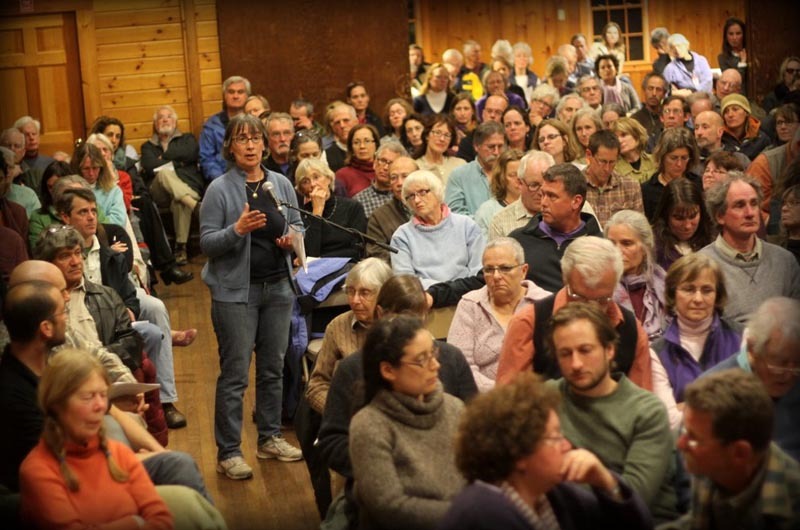 After a passionate and at times emotional debate around preserving the character of Chilmark, voters readily approved a zoning bylaw to regulate house size in town at the annual town meeting Monday night. The measure carried 162 to 51. The vote marks the end of nearly a year and a half of planning by the town planning board and volunteer subcommittee to develop regulations in town to limit house size. The bylaw calls for an extra layer of review and a special permit from the zoning board of appeals for new houses 3,500 square feet per three acres, and limits total living area to 6,000 square feet. Homeowners are allowed 250 square feet per additional acre. Existing homes that already exceed the threshold will be given a one-time exception to increase the total living area by five per cent. A total of 220 voters packed the Chilmark Community Center, with more arriving throughout the night. A large overflow group of non-voters gathered in the entryway. Voters moved swiftly through the first 30 articles, approving nearly all, before turning their attention to the bylaw question. Moderator Everett Poole called the vote after more than an hour of debate. 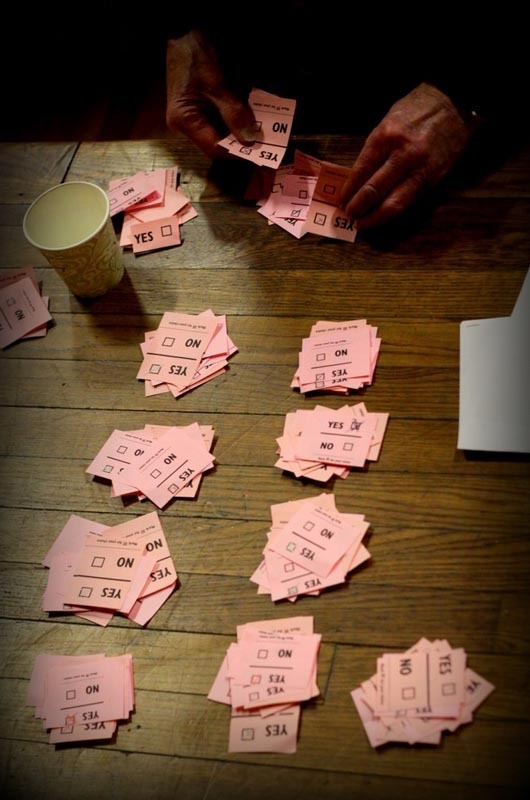 Voters lined up to cast their vote in an Australian ballot count, which allows for voters to write their votes in private. An amendment to increase the threshold from 3,500 square feet per three acres to 4,000 square feet failed by majority, but only after a standing vote was taken. Voters did agree to an amendment that calls for a joint review of the bylaw on a biannual basis to review its impact. Planning board chairman Janet Weidner said the board attempted to create a balanced approach. According to town assessors data used by the planning board, the average house in Chilmark is 2,300 square feet. There are a total of three million square feet in the town of Chilmark; very large houses (more than 6,000 square feet) make up about one per cent of that number. Moderator Everett Poole presides over a packed crowd. This is the second time a large house bylaw has come before voters; in 1991 the town turned down a bylaw to limit house size. 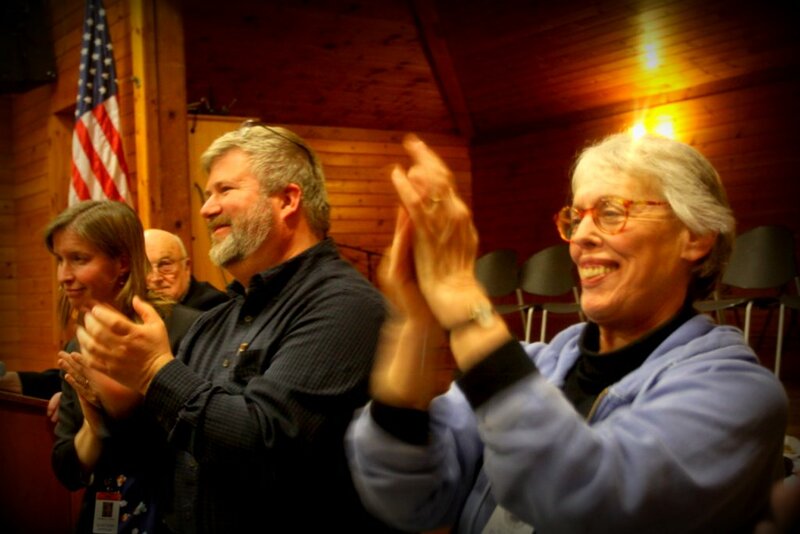 The debate featured a number of passionate stories about the unique quality and history of Chilmark, as well as pleas from residents like Frank Dunkl, who remembered when his family first purchased their North Road property 50 years ago. “I applaud our planning board for responding to the wishes of our citizens and drafting the bylaw we are voting on tonight,” she said. Mrs. Weidner receives standing ovation. Debbie Hancock had a different view, saying voters should consider the effect the bylaw may have on the tax base. She was also concerned about the possibility of increased subdivisions in town. Zoning board of appeals chairman Frank LoRusso agreed and said the 3,500-square-foot threshold was too restrictive. “I believe some of the criteria we’re supposed to follow is much too radical and I think it’s going to be a real problem for us at the zoning board,” he said. 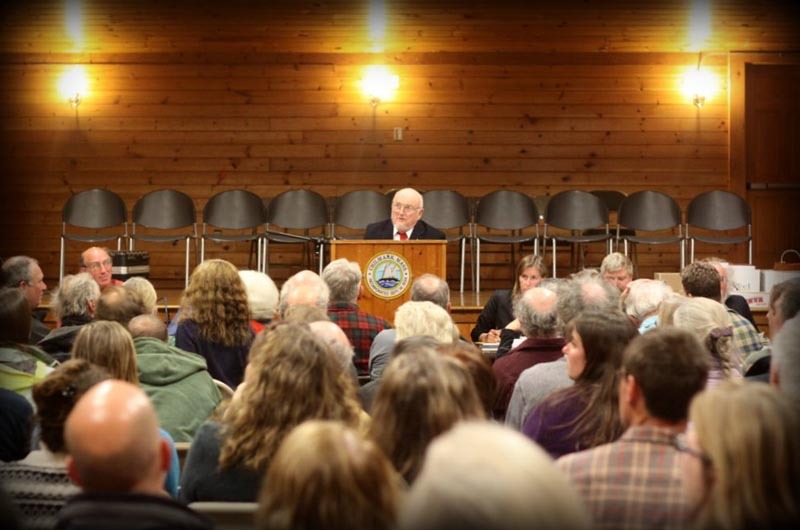 In the end the bylaw was approved as amended on the town meeting floor. A similar zoning bylaw to define the terms “detached bedroom” and “total living area” were also approved. Under the new definitions, total living area will be defined as all habitable space, excluding decks and basements, while a detached bedroom will be limited to 400 square feet and may contain a bathroom, but no kitchen. Both articles required a two-thirds majority to pass. Voters also approved an $8.1 million operating budget, up $360,000 over last year largely due to school spending, including a 2.4 per cent cost of living increase for town employees. Higher student enrollment in the up-Island regional school district and needed repairs to the drainage system at the Chilmark School are the principal added cost centers. A $50,000 spending article to fund the town’s share of the Other Post Employment Benefit (OPEB) fund for municipal employees was indefinitely postponed due to an unexpected shortage in free cash. Voters will take up the funding at a fall special town meeting instead, town executive secretary Tim Carroll said. Voters also approved a transfer of $300,000 from the general stabilization fund to pay for road resurfacing on Tabor House Road and North Road, and $39,000 from the general stabilization fund for the towns’ share of a new ambulance for the Tri-Town Ambulance Service and $31,000 for a new police cruiser. A corresponding Proposition 2 1/2 question appears on the annual town election ballot. Police chief Brian Cioffi asked voters to approve $3,500 for the Martha’s Vineyard Law Enforcement Council. Mr. Cioffi said the money helps to fund training for the Island’s tactical team, which responded to the Boston marathon bombing twice last week. Two Chilmark police officers are part of the team. The vote was passed unanimously. As the evening concluded, planning board member Catherine Thompson thanked Mrs. Weidner for her dedication to the board as chairman for the past four years. It was met with a standing ovation. Voters will be asked to approve three debt exemption ballot questions at the annual town election on April 30. The Proposition 2 1/2 questions include $300,000 for the school assessment, $80,000 to go toward the repairs and $31,000 for the police cruiser. Polls are open at the Chilmark Community Center from 7 a.m. to 8 p.m. Selectman Jonathan Mayhew is running for re-election. There are no contested races. I am proud that the people stood up and said no to Mega Houses, that ruin the Landscape, these homes are used for a couple months and then the owner returns to there other Mega home. The History of the Island was made of smaller homes that blended with the Land, the Architecture was very pleasing., the giant homes in my opinion block the Lanscape and in reaslistic terms are just a boost to ones Ego, making a statement of look at me. I am proud of the vote the People made because if you don't make a good regulation then all of a sudden your whole Island will be Land of the Giants! Remember Natural beauty can not be improved on by covering it up. I agree ALL those big homes on North and South Water street in Edgartown. Glad to see they didn't have a Large ego and followed your insight.